Thoughts, ramblings, clippings on noh theatre. © Diego Pellecchia 2009-2018. Unauthorized use and/or duplication of this material without express and written permission from this blog’s author and/or owner is strictly prohibited. Excerpts and links may be used, provided that full and clear credit is given to Diego Pellecchia and 外国人と能 with appropriate and specific direction to the original content. Next Sunday (November 3rd, which is both my birthday and the ‘culture day’ in Japan) I will take part to the Matsuyama Shimin Noh performance at the Yamatoya Honten Noh stage in Matsuyama, Shikoku. 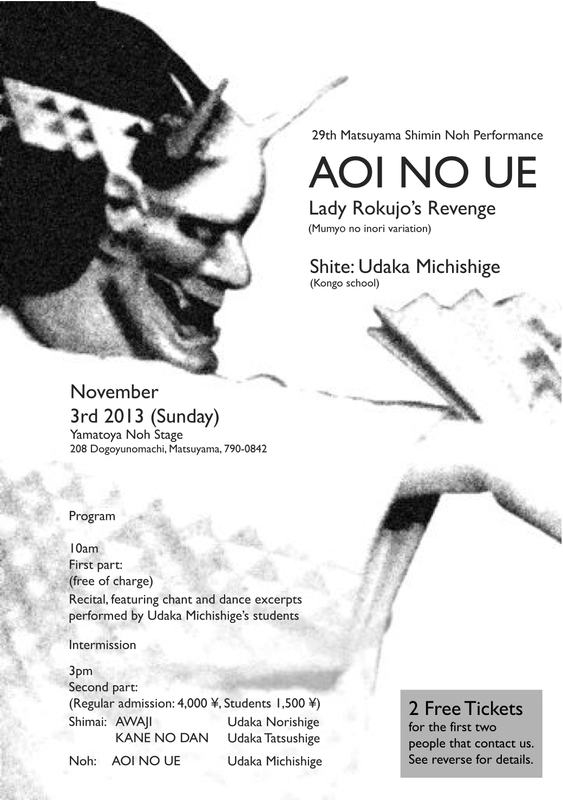 The event begins at 10:00 with a recital (entry free of charge), featuring Udaka Michishige’s students. I will perform a shimai, or dance excerpt, from the Noh Uta-ura, and will sing in the su-utai chanting of the Noh Kogō. The main event will be Udaka-sensei’s performance of Aoinoue in the ‘mumyō no inori’ kogaki, or variation. I am lucky enough to have a privileged observation spot, serving in the ji-utai chorus for this performance. Every year in November Udaka Michishige takes the shite main role at the Matsuyama Shimin Noh performance. Although based in Kyoto, Udaka regularly teaches both utai/shimai and mask carving in Nagoya, Okazaki, Tokyo, Yokohama, and Matsuyama in Shikoku, the area where his family originally comes from. He is a descendent of two Shikoku families: Udaka and Kawada. The Udaka family had a castle in Niihama City during the medieval period and later served the Matusdaira clan feudal lords in Matsuyama as Noh actors from 1712 until the start of the Meiji period. For this year’s shimin Noh we are giving away 2 free tickets to the first two people who contact us so make sure not to miss this chance if you are in Matsuyama next weekend! Find contact details below. Based on an episode from the Tale of Genji, the 11th century masterpiece by Murasaki Shikibu, the main character is not Lady Aoi, the wife of Prince Genji, but Lady Rokujo, the most intriguing female character in the novel. Once Genji’s lover but now abandoned by him and filled with resentment towards his wife after a humiliating incident at the Kamo Festival where her coach was forced out of its viewing spot by Lady Aoi’s retainers, Lady Rokujō’s living spirit torments her rival. A shamaness is sent to discover the source of the possession of Lady Aoi and then an exorcism is performed by the priest Kohijiri, finally bringing Rokujo to her senses by calling on the power of the Buddhist sutras. In the mumyō no inori kogaki or ‘Exorcism in Spiritual Darkness Variation’, the robe used to represent Lady Aoi is white rather than red, and Lady Rokujo leaves the stage for a change of costume rather than retreating to the koken-za stage attendants’ seat for only a change of mask. She returns in nagabakama, long vermillion trousers, often with a Nagakamoji, an extension of the wig that emphasises that Lady Rokujo’s is a noblewoman, increasing the sense of horror at the intensity of the expression of her jealousy in choreography also more graphic than in the standard production. The Seiran-Noh (青蘭能) is a yearly performance at the Kongo Noh theatre in Kyoto featuring Udaka Michishige and his sons, Udaka Tatsushige and Udaka Norishige. Until now known as ‘Seigan Noh’, the event has recently changed its name into ‘Seiran’ honouring Udaka Michishige’s great-grandfather, painter Kawada Shoryo (1824-1898), who was closely related to Sakamoto Ryoma, one of the central characters in the Meiji restoration. Kawada’s favourite flower was the orchid (‘ran’ 蘭). This year’s Seiran Noh (8 September 2013) features the Noh Midare, a special variation (kogaki) of the Noh Shōjō in which the midare-ashi a particularly unusual and challenging dance, is performed instead of the usual chu-no-mai medium tempo dance. Midare is a hiraki-mono, one of the plays marking a performer’s passage into a new phase of their career. This year Udaka Norishige will perform Midare, follow ing his father and elder brother’s steps. The second play is Futari Shizuka, (‘Two Shizukas’), a third category play based on happenings and characters from the Genpei War tales. The special feature of this play is the instrumental dance performed by identically dressed shite and shite-tsure: the spirit of Minamoto no Yoshitsune’s lover Shizuka Gozen and a woman possessed by her. Futari Shizuka will be performed by Udaka Michishige and his eldest son, Udaka Tatsushige. Synopses of the plays will be available at the theater in English, French, German, and Italian.